Auxiliary subunits regulate the trafficking, localization or gating kinetics of voltage- and ligand-gated ion channels by associating tightly and specifically with pore-forming subunits. However, no auxiliary subunits have been identified for members of the Cys-loop receptor superfamily. 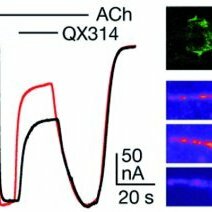 Here we identify MOLO-1, a positive regulator of levamisole-sensitive acetylcholine receptors (L-AChRs) at the Caenorhabditis elegans neuromuscular junction. MOLO-1 is a one-pass transmembrane protein that contains a single extracellular globular domain-the TPM domain, found in bacteria, plants and invertebrates, including nonvertebrate chordates. Loss of MOLO-1 impairs locomotion and renders worms resistant to the anthelmintic drug levamisole. In molo-1 mutants, L-AChR-dependent synaptic transmission is reduced by half, while the number and localization of receptors at synapses remain unchanged. In a heterologous expression system, MOLO-1 physically interacts with L-AChRs and directly enhances channel gating without affecting unitary conductance. The identification of MOLO-1 expands the mechanisms for generating functional and pharmacological diversity in the Cys-loop superfamily. Nat Neurosci. 2012 Oct ;15(10):1374-81. doi : 10.1038/nn.3197.